Christmas is known as the season of giving. Impact 52 is inviting you to join us in this wonderful season, for 25 Days of Giving. We have identified several ways we will give from December 1st through December 25th. We hope you will join us on this 25-day journey to give and brighten the lives of others. Feel free to participate every day or select the days you are willing and able. You can participate in coordination with Impact 52’s efforts or you can participate individually/remotely. We will share each day’s experience and we ask that you do the same. Share your pictures on Twitter and Instagram using the hashtag #25DaysGiving. Post your photos and comments on our Facebook page. Help us start a movement in our communities. It is Impact 52’s 25 days of Giving . One more step in our creation of an epidemic of giving. We love Random Acts of Kindness! So why not start our 25 Days of Giving with just that. When you are out and about on your busy Saturday, purchase the drink for the person behind you in line. 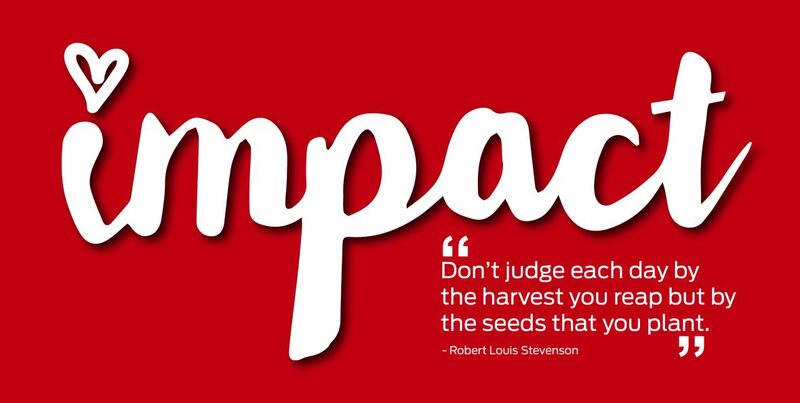 You will never know the impact it could have, but we are positive it will brighten someone’s day. Who doesn’t love getting poetry? Take a few minutes and write a special friend a poem, or even a co-worker a silly one. We guarantee it brings a smile to someone’s face. There are so many great organizations out there that need clothing donations. For Day 3, we have chosen to donate gently used clothing to Street Reach for the Homeless. Street Reach for the Homeless has several drop-off points throughout Fort Wayne. Have you ever gone downtown to park and realized that you didn’t have any change for the parking meter? Or you got all excited when you found a parking spot that had the meter running still? Take a break and fill some local parking meters with change. A kind gesture may only take a brief moment. Find opportunities to show a kind gesture towards a stranger or even someone you know. A kind gesture could be as simple as holding a door or carrying someone’s groceries. Many of us make it a habit to clean our children’s closets / toy chests before Christmas Day. Then the decision becomes what to do with all of it. Impact 52 will be donating games to the Boys and Girls Club this holiday season. This is an organization that provides a safe and secure place where youth can interact with others after school to experience a healthy positive social atmosphere. The Boys and Girls Club is always in the need of activities for the children. Join us by donating gently used or new games to the Boys and Girls Club or another children’s organization. Let no one person go hungry by donating food to a food bank. There are several food pantries or collection points throughout the city, such as Community Harvest and Associated Churches. Another convenient way to donate is by purchasing a prepackaged food donation at your local supermarket. Our servicemen, such as our military, firefighters, and police officers serve our country and communities throughout the year. There are several ways to show our appreciation, such as thank you notes or baked goods. We plan on making baked goods and delivering them to some of our servicemen. Do you get excited like we do when the mail comes every day before Christmas, wondering who would send you a Christmas card today? We love getting cards and we want to brighten someone else’s day by giving them an unexpected card. We will be making homemade holiday cards and delivering them to a nursing home. Please join us by helping make cards to be delivered. If in Fort Wayne, send us an email and we can arrange to pick them up if you want to include them in our delivery. Lives are busy and many times we go day after day without saying thank you or expressing our gratitude to people in our lives. We will sit down and write handwritten thank you notes to at least five people and hand deliver them. We love animals. We hope you do too. Make a donation of food, towels, or toys to a local pet food pantry or animal shelter. Pick up the phone and reach out to someone you haven’t spoken to in six months or longer. It is very likely that you will hear the bells of Salvation Army bell ringers this time of year. Impact 52 will actually be ringing the bell the evening of the 13th at Hobby Lobby. Make sure to stop by and make a donation at our site or many of the others around town. No gift is too small! Take a minute to compliment someone, make him or her smile, or brighten their day by singing to them. Purchase 5 – $5 giftcards of any kind and randomly distribute to strangers. Not only will we be helping with the Penny Pitch at the Komets game to benefit the Ronald McDonald House, but we will look for ways to donate our change throughout the day. Have you ever noticed the change jar at Speedway that benefits Riley Hospital, have you been asked to round up your total for a charity at a retail store, or have you noticed the change boxes at the McDonald’s window that benefits each local Ronald McDonald house? Donate your change! We will be making holiday care packages for our homeless friends that we have met through Saints on the Streets. Please join us by donating items for these care packages or making and delivering your own care packages. Some items of need are emergency candles, hand warmers, socks, hats, gloves and individually wrapped snacks. Every child enjoys being read to . . . take the time to read at a school, library, or to a child that you know. Give a life by donating blood or platelets today. Or if you are unable to do it on this particular day, schedule another day in the near future that accommodates your schedule. Give the gift of reading. Donate new or used books to a school, daycare, or community organization. During the busy holiday season, many of us find ourselves eating out. Surprise your waiter or waitress by leaving a generous tip. Make a homemade gift and deliver to your neighbor(s). Give social media shout outs to individuals who have made an impact in your life. Christmas Day is a great day to give a gift showing our love and appreciation to a friend or family member. We plan to give a family member(s) a special gift on this day. We will join Impact 52 for 25 days of giving. Will you?